When Gabe’s mother, Rita, fell at home, he knew it was time for her to move in with him, but he also knew it was important to keep her active. After considering all of his options, he found that the Easterseals’ adult day services were the absolute best fit for his family. 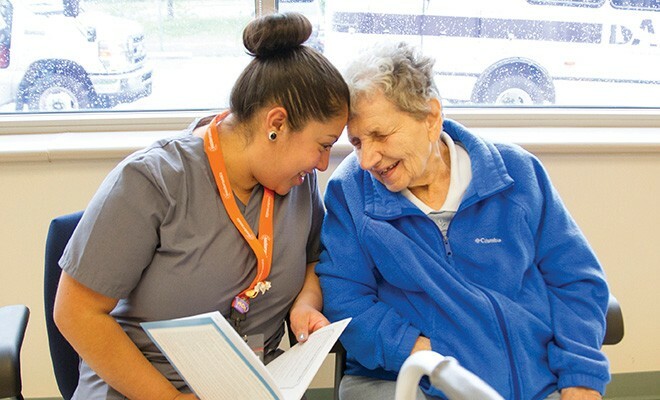 Easterseals adult day care services provide support for adults, young and old, who have experienced a disabling condition such as Multiple Sclerosis, stroke, brain injury, other physical limitations and conditions of aging. Transportation and meals are provided. The program provides a break from caregiving for families or those who work and have other responsibilities. A full-time nurse provides medical support including monitoring of blood pressure and blood sugar, coordinating with physician offices and arranging appointments. The nurse acts as a liaison between participant families, case managers and other health care providers. If needed, physical, occupational and speech therapies also are available on site through Easterseals, and can be added to the individual’s personal care plan. In addition, trained staff are able to help all participants with activities of daily living and personal needs. Like all Easterseals services, adult day care services are comprehensive and individualized to meet each client’s needs, family-focused to meet each family member’s concerns and have the goal of enhanced independence. The adult day care program offers a break for family caregivers responsible for a relative who is unable to function independently, but does not require 24-hour nursing care. For more information about Easterseals Adult Day Care Services contact Gwen Harris at 302-324-4444 or gharris@esdel.org. ← Previous Story Pssst . . . Did You Know That Home Care Isn’t Just For Seniors?